My art brings an illustrator’s technique of realism and surrealism to the fine arts arena. The intent is to set my work apart from ‘Pop Art' and ‘Folk-Art' by depicting real life events consequentially, addressing the needs of fine art audiences who demand cultural and innovative renderings of the unexpected. The collections of "Urban Mannerist Pop Art" in acrylic paint, mixed mediums, and ink are many times very graphic in content and can sometimes startle if not offend the observer, however upon further examination the observer is captivated and drawn into the life experience. The spectator is forced to face truthful realities of humanity. The focus is to peel away the outer layers of still life and graphic illustrations to reveal the disguise of what would once be considered ordinary. 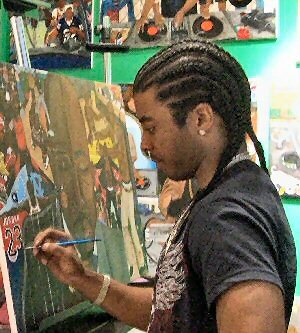 As I continue to evolve as an artist, a main objective is to advance in my response to specific demands of the art world while staying true to personal interests in unique subject matters. I invite you to go beyond your comfort zone and visit those who have a much greater story to share with us.